November 27, 2012: Don’t Forget!! SPELLING: Since there is no school on Friday, we will not be doing a spelling unit this week. We will resume our spelling units next week. LIBRARY: Since there is not school on Friday, we will be visiting the library on Wednesday. Don’t forget to bring your books!! RECORD’S DAY: There will be no school on Friday due to record’s day. SELF-ESTEEM PROJECT: Your child will be bringing home their December self-esteem project tomorrow, it is a stocking. Please have your child return it by Monday. FAMILY GIFT: We will begin working on our family gifts next week. Please send in the $1.00 donation by next Monday.. THANKS!!! November 22, 2012: Happy Thanksgiving!! 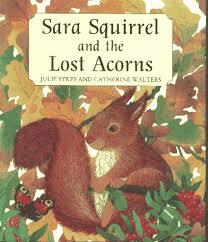 Last week we read Sarah Squirrel and the Lost Acorn, written by Julie Sykes and Catherine Walters. Your child should have brought home their envelopes, retelling paper, and a real acorn on Friday. Don’t forget that all of your treasures should be kept in your treasure chests. Please return the envelopes and retelling sheets by Tuesday. If you would like to listen to this week’s story, just click on the title below. THANKSGIVING FEAST: On Monday, we will be having our Thanksgiving Feast with the other second grades. Don’t forget to bring in a baggie full of a cut up vegetable to add to our one pot turkey soup. Our Feast will not be until 1:30 in the afternoon, so please make sure you still bring a lunch. If you volunteered to help, please be at school around 1:00. GYM & LIBRARY: We have Gym class on Tuesday, don’t forget to wear/bring tennis shoes. Since there is no school on Friday, we will be holding onto our library books until the following Friday. THANKSGIVING BREAK: There will be no school on November 21-23. School will resume on Monday, November 26th. Here is a fun game to play for Thanksgiving. You have to dress up the turkey (kind of like disguising him,) so the farmer can’t find him. Just click on the picture to get to the website. Once there, there are a lot of other fun games to play. Just click on “Holiday Fun” under the game (at the website) and it will take you to the other Thanksgiving games. HAVE FUN!! !